Snappy Ginger Spice Tea is made of supreme ginger, selected tea leaves and rare herbs, creating this spectacular flavor, unlike anything you may have experienced before. This black tea blend is among the most popular flavors and we make it uniquely tasty. It is one of a kind; we are sure you will agree. 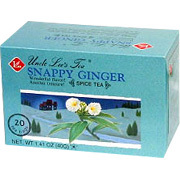 Snappy Ginger Spice Tea - is shipped in a discrete, unmarked package. Orders are processed immediately and usually take about 3 to 5 working days to be received. We do ask that you try it for 2 to 3 weeks to feel the full effects. Any information received is used only for order processing and shipping purposes. Your information, such as e-mail address, will never be disclosed to a third party.